First, I had to inject myself with Fraxiparine every day and to take high dosage of Folate (Folate, not folic acid, there is a difference). 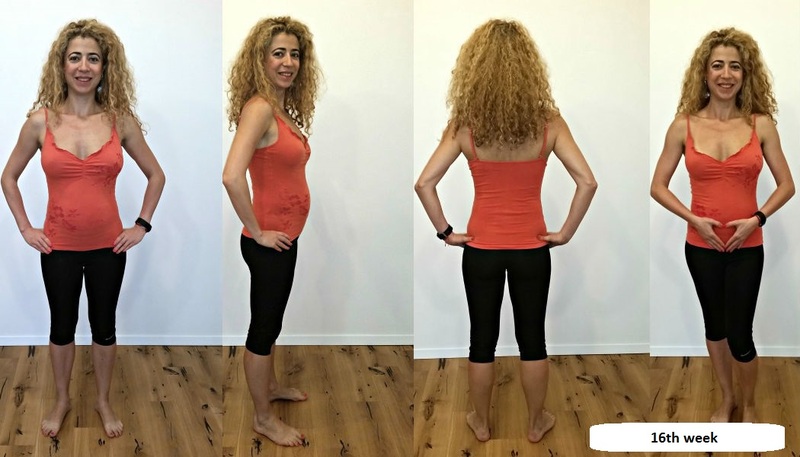 In another post I will tell you all about the genetic mutations for which I had 2 spontaneous abortions and for the supplements I take in my case and as a whole through the pregnancy. I already wrote about how I found out that I was pregnant and how much my breasts hurt. So much that since week 5 I couldn’t sleep on my belly anymore, which is my favorite sleeping pose. Goodbye sleeping on my stomach, will I ever be able to sleep like that again?! Other doctors used to assign me therapy just based on my age, without any additional examinations. No, thanks! In my 8th week, we went to Greece on a trip and before that I went to get an ultrasound to see if I still have the detachment. It had started to reabsorb; the shadow that was there had become smaller and now mixed with some lighter things at the end, which continued to the center. For me, going to ultrasounds is very nice, I love watching in the screen, but I often need to be shown more, because I don’t see right away what the doctors see. We went on our trip to Greece. It has already started to show in my 8th week. I definitely have a bump in my lower belly. I immediately started gaining a little bit of fat on my thighs and booty. Nothing much, but for someone who has six pack that is noticeable. It happened twice I was so hungry that I started to feel sick and shake, to sweat and feel very bad whilst in Greece. Usually, when I’m hungry, there is not a problem for me to wait 2-3, even 5-6 hours. I even like to feel very hungry so I have more pleasure eating. Now, I surprisingly found out that my tolerance for hunger is 30 minutes max! Right after that I start having low blood sugar symptoms that I established with my glucometer when I got back to Sofia. My blood sugar would go down below 4 (3 and something is scary), without changing my way of eating (I could still eat what I want). I remember how I cried in Greece, because I had to eat right away and we were with friends on the trip and I felt uncomfortable to scream to them ‘Shower quickly, get dress, rub whatever you rub on yourselves after the beach and sprint to the nearest restaurant”. My hands would start shaking from hunger, I had cold sweat, I felt sick, nauseous and powerless, not understanding what was going on. The first time that happened, I thought it was by accident. BUT in the next day – the same!!! I just couldn’t stand more than 4-5 hours without food. Maybe for someone that is normal, but before that, I ate twice a day in a window of 8-10 hours. I.e. I could hold 14-16 hours of non-eating, eat a lot afterwards, wait 7-8 hours to pass and eat again. For 2 days I found out that this cannot be my way of eating. Going on the beach, I would bring a bag of nectarines or something else. And the bad things do not stop here. Everything would swim before my eyes when getting out of bed or a chair since 6th week. 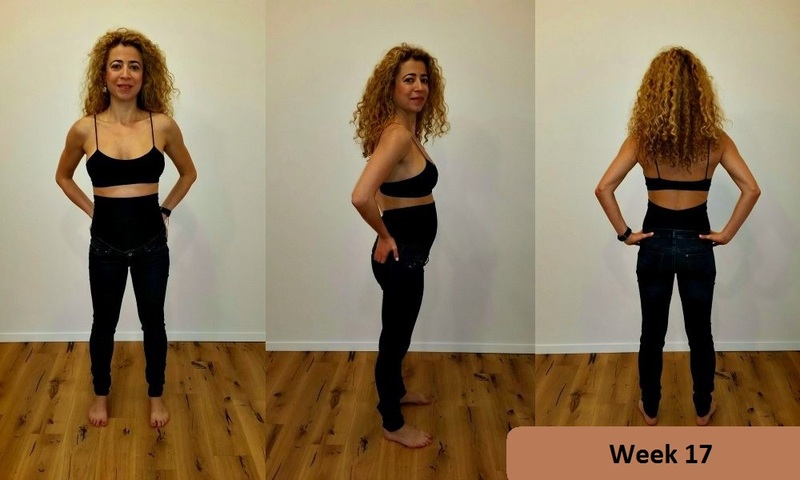 That’s why I thought of the stable pose, we use it with every standing up from the program for pregnancy. I get up, so a half squat, with the hips to the back, a straight back, palms over the knees and breathe until I feel better. It usually took 2 seconds to pass. I would also get out of bed, do a few steps to the nearest wall and lean on it. I would take a deep breath, hold it for a while and let it out. I spontaneously knew that I need to breathe, as if my brain wasn’t getting much oxygen and that’s why I feel bad. It’s possible that it’s actually happening and you get a ‘orthostatic shock’ – when getting up, the blood goes to the limbs and for a brief moment there is less oxygen reaching the brain. It’s interesting that when I started to take vitamins for pregnancy with iron, the bad feeling and vertigo passed away for 2 days. I had some suspicions that I might have less iron, because my Ferritin would go down. It’s not okay to take iron just like that, I will write another article for all the supplements I take. Sadly, in my case, I feel much better when taking them, there is a difference (I hate supplements). Also, in this period the blood vessels of the pregnant lady start to grow bigger. That led to even lower blood pressure with me. At one pharmacy in Greece, you could measure your blood pressure and I measured it for a few days – 85-55, congratulations. Hysterical hunger, vertigo, injections every day and supplements … what a start! In the end of 8th week, the repellency to leafy greens started. I usually eat at least one big salad with green stuff in it, more often two per day. For the 9 days in Greece, I ate something green just twice. However, everything needed to be sour. Wow, the amount of stuffed wine leaves I had! Drizzled with lemon at all cost! I couldn’t stand the smell of coffee and at breakfast in the hotel, I would make myself a shot of espresso and a fresh orange juice, which masked the coffee smell, even though in 8th week I would still drink coffee and be okay with it. Around 10th week I’d have 1-2 sips of coffee at morning, terribly light, and I would feel sick from the coffee of My Love. I would even ask him to brush his teeth after he had coffee, because otherwise I wouldn’t be able to get near to him. All these things in the beginning would feel like whims and I would feel very ashamed of myself. I tried keeping a straight face but I couldn’t stand strong smells. Perfumes became taboo. I could smell all kinds of things from a very long distance. The streets would smell awfully of food. Then I read that this is a safeguard mechanism with pregnant women – to be able to smell if some food is gone bad even the slightest, so I decided to keep away of smelly places. In my 9th week, I started craving dough and dairy. The nausea was now at all times. I’m hungry and nauseous. I’m full and nauseous. I didn’t throw up once, but the feeling was quite bad. I couldn’t find what to eat, because even from the thought of all food I would feel nauseous. I constantly asked my sister and my mom what will they be cooking, and they say ‘You’ll feel like having it’ and my reply would be ‘That’s the point’. Not that I was starving. When I found something I liked eating, I ate a lot of it, because I didn’t know when I’ll feel like having it, i.e. I wouldn’t feel sick of the thought of that food. But I would feel hungry, too. I took turns of overeating with starving. I had the feeling I have an eating disorder and I felt so bad about clients that have shared an unhealthy connection with food. It wasn’t enough that I would feel like a crazy spoiled person, but all chronic diseases I used to have as a child and got over came back. For example, I would often get gallbladder attacks, which manifest in nausea, diarrhoea, unbearableness for all food for 24 hours, accompanied with a strong pain near the solar plexus. Well, that happened too. I used to take painkillers and wait for 24 hours to pass. Now, I can’t take painkillers, I would only use Spasmalgon and it’s forbidden during pregnancy, so I managed to get through 24 hours of pain. It felt like I was about to get cystitis for a few times, but I somehow manage to escape from that and didn’t have it. I used to get Tonsillitis 2-3 times a year (I haven’t had it for the past 5 years). In the first trimester I felt a slight pain in my throat, but it would pass away quickly. Not only this, but I got the virus with diarrhoea and vomiting twice. I couldn’t throw up, just heavy nausea, but real heavy, and a great diarrhoea. You get dehydrated at max, no matter the water you drink. I haven’t felt so weak, powerless and defenceless. I wanted to cry over how powerless I’m towards my body. I had will, strength, I’ve been working out for so many years and all of that was gone. I’ve had varicose veins for years, but they don’t change, don’t hurt, not a big deal. Now they dilated, became raised, would hurt and I would feel them. From 8th week onwards I became burping all day. But not a loud burp, but it’s like a bubbling. It wasn’t connected with the food only. I would bubble all day, 50-100 times for sure. That disappeared around 13-14th week. 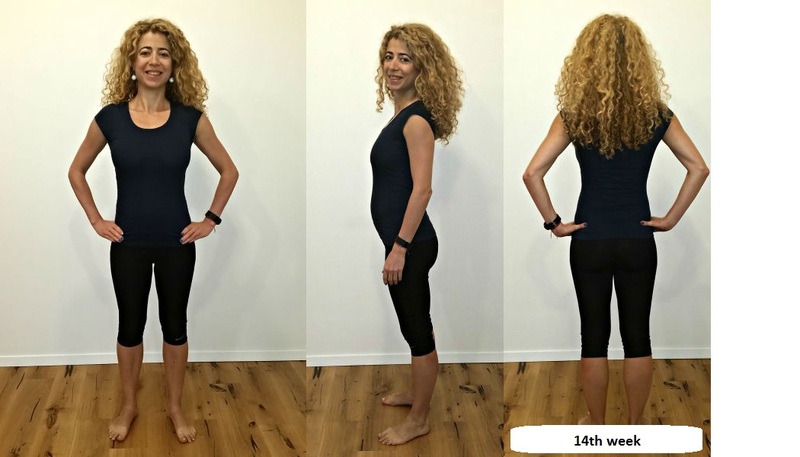 From 8th to 14th week, I had a crazy itching feeling on my belly. It would itch so hard, like some sort of a disease. Sometimes I would give in to it, which didn’t really help, it would itch more. If I catch myself itching, I started to massage my belly, to do all sorts of poses just so I don’t scratch my skin. Interesting as it seems, it was only on periods I had to resist and then it would go away. I’ve been rubbing oils and creams for stretch marks since week 5 just in case, I will point them out in a separate post, because I use a few, I combine them on purpose, so I can take the advantages of all oils. Around week 10, I couldn’t live without sour cucumbers, but naturally fermented, not marinated. You use fresh cucumbers, put them in a jar with water, sea salt, celery. The fermentation occurs in room temperature. In the summer, they’d be ready in 4-5 days, in the winter – 11-15, depending on how sour you’d like them to be. I’ll have to do another post about that, as natural fermentation is an awesome way to get probiotics and it’s so easy, cheap and healthy. I would eat 1 jar for an appetizer. I drank the water from the marinara as well. Mentioning water, what I thirst I was feeling! And it wasn’t only from the pickles (they are a bit salty, even though I reduced the salt I put in there). I would drink water at all times and stay in the bathroom. Sometimes I got up 5-6 times at night to go to the bathroom! I tried not drinking water after 6 PM but I was thirsty, so I got over the bathroom visits. It’s good that I fall asleep right after and I didn’t have sleep problems. The interesting thing about this pregnancy is that I didn’t fall asleep during the day. During my first pregnancy I would feel so sleepy in the afternoons, so much, that once we were at a café with My Love, because I couldn’t stay awake (we were in Italy) and I said ‘I’ll just lay my head on my hands to rest’ and I’ve fallen asleep on the table at the café!!!! With this pregnancy I didn’t want to sleep, but after 9th week I wanted to be lying down. I would feel sooooo attracted to my bed. I wanted to lie down and read a book during the day. I didn’t want to stay up or sitting, but definitely lying down. I work from home, so I could afford being in bed working. I was shocked by my food taste changing in week 10. On my birthday, My Love and I went to a pizza place, because all I wanted to eat was dough and now I had the occasion to spoil myself. Not that I allowed myself dough and cheese more than twice a week, but that’s all I wanted to have. Before my pregnancy, I would avoid gluten and dairy. 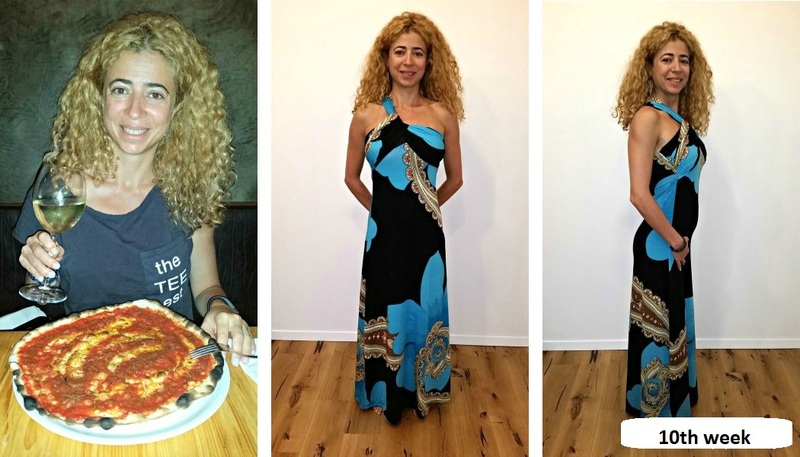 During my pregnancy I included Greek cheese, yellow cheese and yogurt every once in a while, just because I wanted to eat them very much and I didn’t want to develop and eating disorder by forbidding them. When you know something is not forbidden, you would want to eat it less often than the other way around. So, on my birthday I order tagliatelle and a pizza. Back then, and now I think that I don’t eat more as supposed to before my pregnancy. When I’m with My Love, I order a lot of stuff, because then he finishes them off for me 😀 (thank you, Love 🙂 ). I neither finished the pizza, nor the pasta, but I did satisfy my cravings for dough 🙂 . My Love starts eating the pasta and says ‘This is too spicy for you, how did you managed to eat it? (I don’t eat spicy, as supposed to My Love, he eats ultra-hot and spicy). And I say ‘Spicyyyy? No, it was just a little bit piquant.” Then I found out I can eat hot spices. What I wanted to eat at that period – mostly fruit, dough and dairy. I tried to have other nutritional substances, but it was hard work. 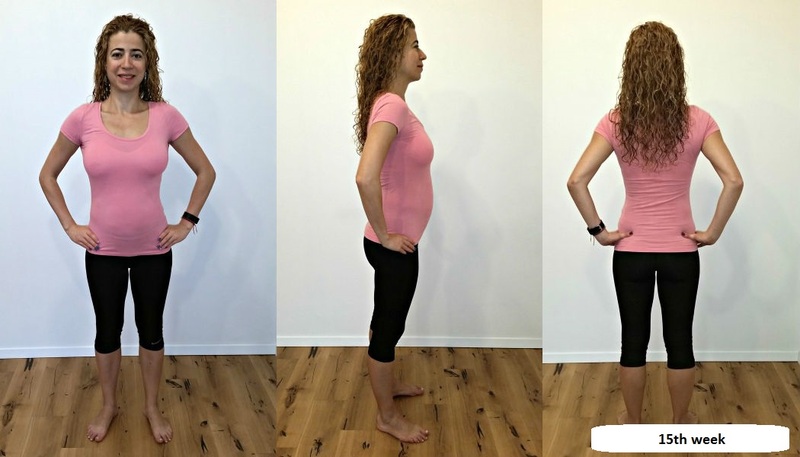 In week 9, I made the mistake of forcing myself to eat what I think will be good for me and the baby for a week, but the nausea increased. So, I ate what I could. I also couldn’t cook. I didn’t cook for about 5-6 weeks, just a salad, and only with tomatoes and cucumbers, no leafy greens. Spices became taboo, I used only salt. At the end of week 11 I was allowed to work out again and I came back to my workouts. Extremely careful, one step at a time, with baby workouts. I’d lost a lot of strength and durability. From the entire swan walking I had become so gracious and light that jumping around felt too rough for me. I couldn’t go back to it, so I just gave up – it’s not my thing right now. Around week 11 and 12 I stopped with the hypoglycemic episodes. I would say that happened because of the change of my eating habits, but that’s not entirely true, because I ate what I could. They just disappeared because I didn’t do anything specific about it. And when they appeared in the first place, I could eat quite close to my previous way of eating, so I don’t think they were connected with what I eat after all. According to Doc, they were because I was stressful. But I was super calm. There wasn’t anything I was worried about. Yes, I didn’t feel good on many levels, but I was calm. Maybe the physical stress of new genes in me, my immune system trying to accept them, the synthesis of the baby, how could I know?! 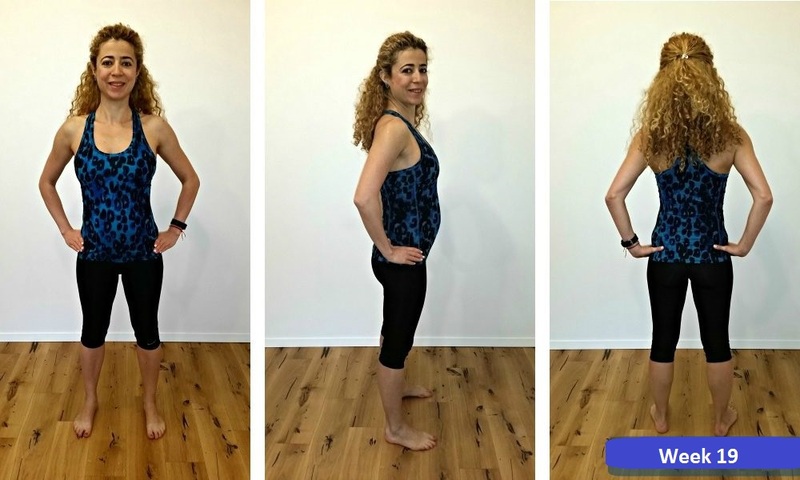 I started working on the pregnancy training program in my 12th week, just because the workouts for the first trimester I filmed in my second trimester, as I was forbidden to workout. The program turns out really well, powerful, with low intensity, no jumping, even though you can add some if you like. There aren’t any in the cardio workout but it will make you sweat really well. Side note: you can jump and run during a pregnancy, but that is just not my thing right now. What you must not do is work out for the abdomen with isolated exercises. Really, around week 12, the bad stuff started to go away. 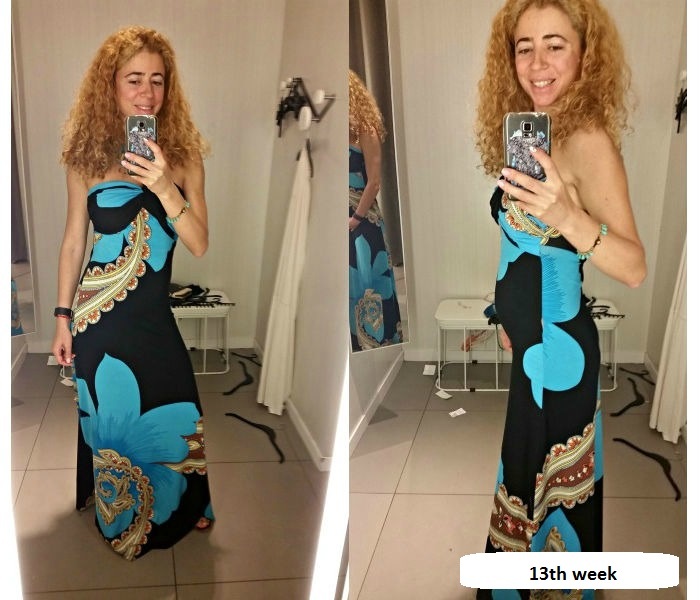 I felt super good in week 14, I didn’t have any pregnancy clichés. Even though I’m still a pregnancy cliché, a terrible first trimester, a good second one. Let’s see how I will be with the third one, usually it wasn’t pleasant at all, I’m a cliché after all, maybe this is what is ahead of me, but whatever it is, I’m waiting with an open mind. Do not allow yourself to compare with other pregnant women. Every pregnancy is different. Even short, my first two were different than this one. 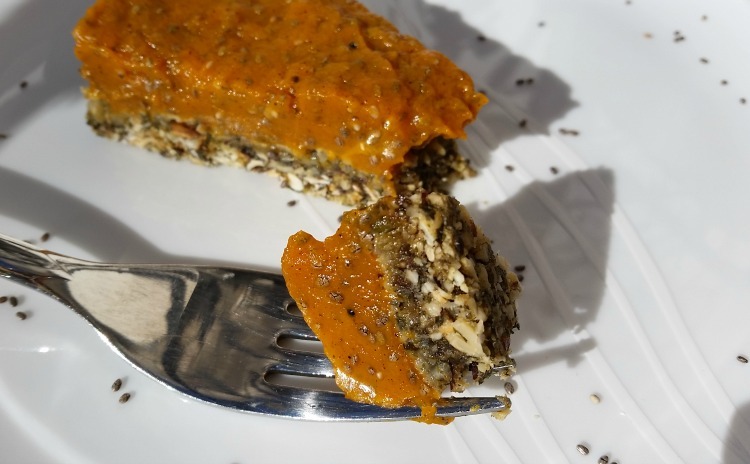 Do not blame yourself if you can’t eat what you think will be good for you and the baby. If someone said to me that I should eat this and that because it was good for me and the baby, I wouldn’t be able to. I ate what I could. I couldn’t eat what I had to eat. The most interesting thing this week was the regular ultrasound in Doc’s office 🙂 .